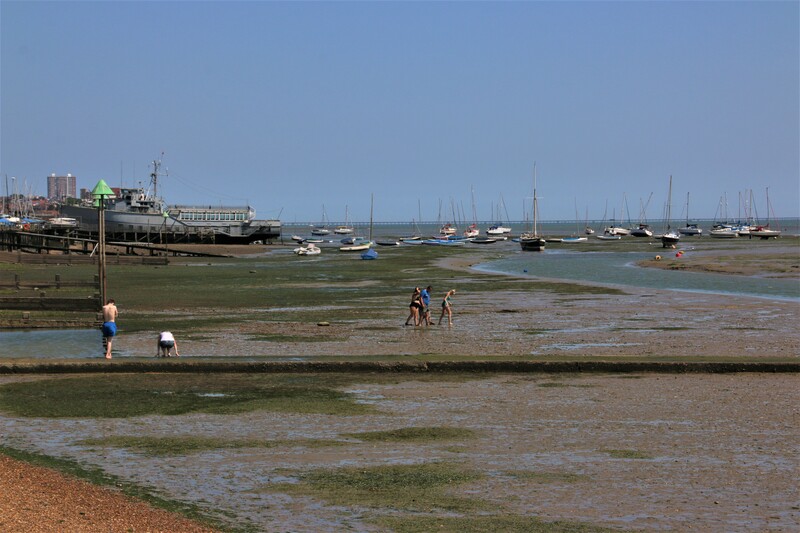 A day by the seaside at Southend-on-Sea …… or is it: -on-estuary? The sun continues to shine and draw me away to continue my travels. You may remember that a few years back my journey down the east coast was interrupted when my car decided to stop in a huge plume of smoke and I had to get home on the back of an AA low loader. 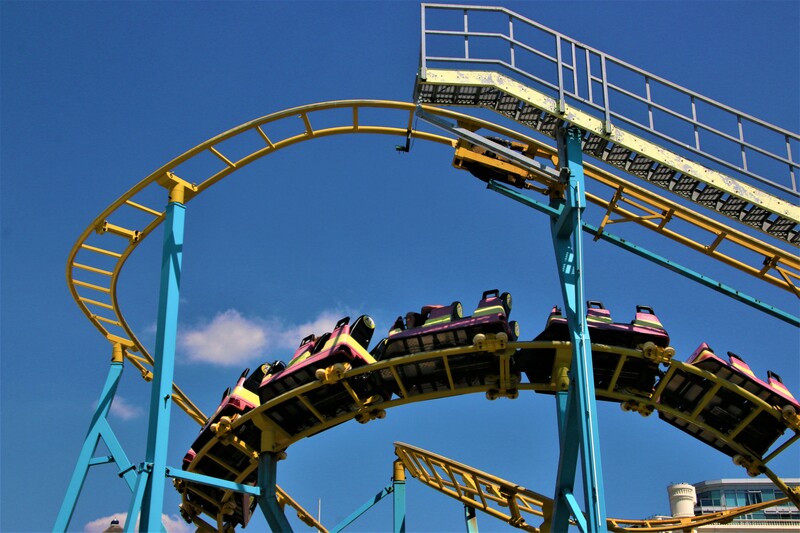 See, the life of a travel blogger is no easy ride (ooohhh, actually it was very easy!!). So I missed out visiting Southend (on the east coast). Now, here I have a real quandary. 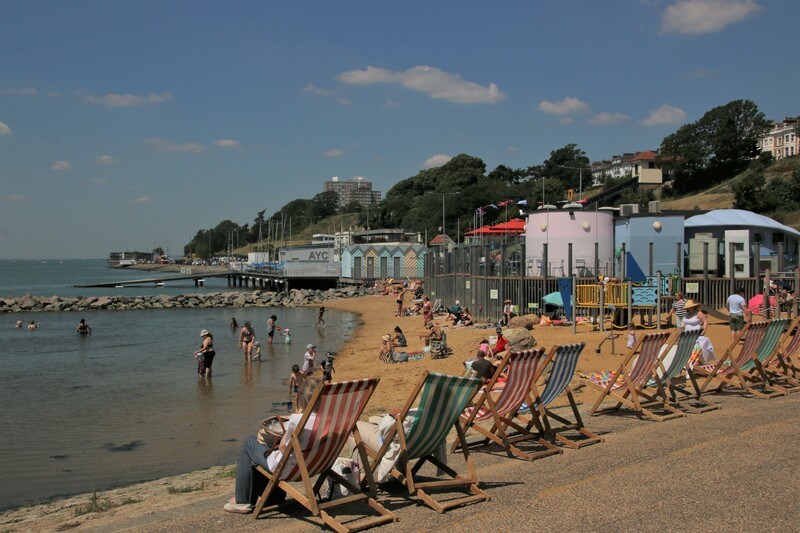 My question, that many of you have helped me with, but no-one head give me a categorical answer, is this: is Southend-on-Sea on the coast as its name suggests? Or is it on the estuary? Even locals cannot give me a definitive answer. 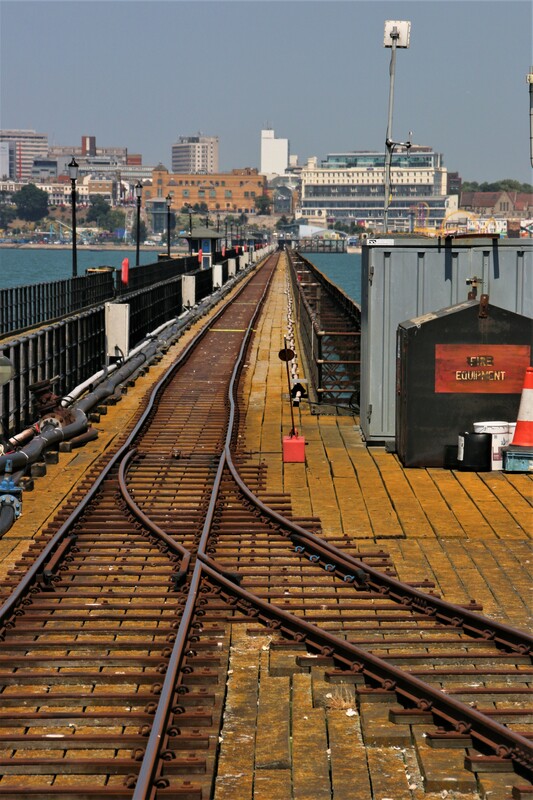 But, as its name includes the word ‘sea’ and as it proudly claims to have the longest pier in the world..and as it has Rossi’s ice cream, I feel duty bound to include this long piece of seaside as part of my coastal journey around the UK. 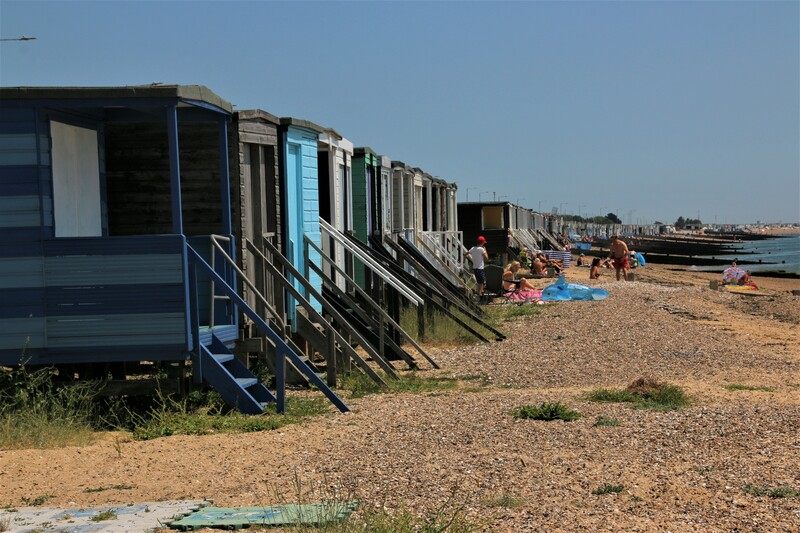 So first into the beach huts and sea defences of Shoeburyness which is tucked neatly around that marshy bit of coast, facing across the estuary to industrial skyline on the Kent bank on the other side. 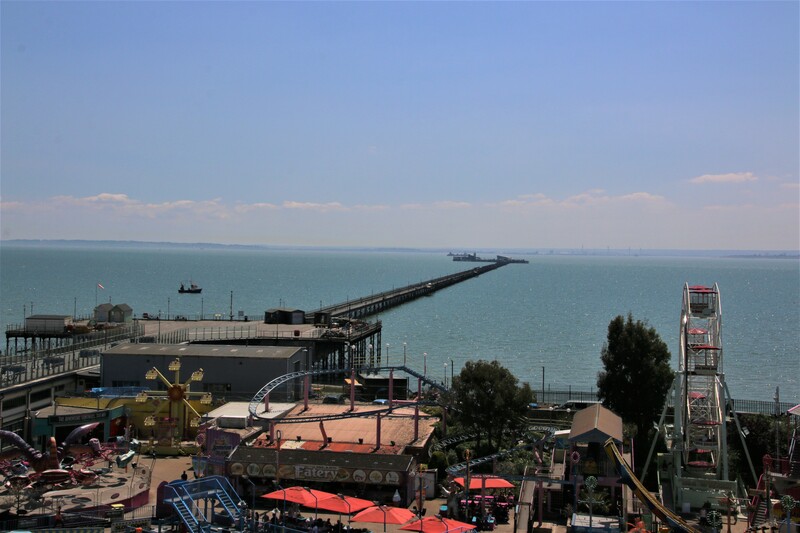 The beach blends seamlessly into the traditional seaside delights of Southend-on-Sea where Victorian elegance stretches side by side with the coats of colour of fairgrounds & arcades, candy floss, rock & ice cream. Easy to reach from the East End of London by the early railways the resort soon took off with its soft sandy beach and long paved promenade with a line of rather stunted palms, supposed to remind us of the south of France. Around the front of the pier a collection of fairground rides rattle and squirm and hiss and scream to let the punters know they are on holiday. 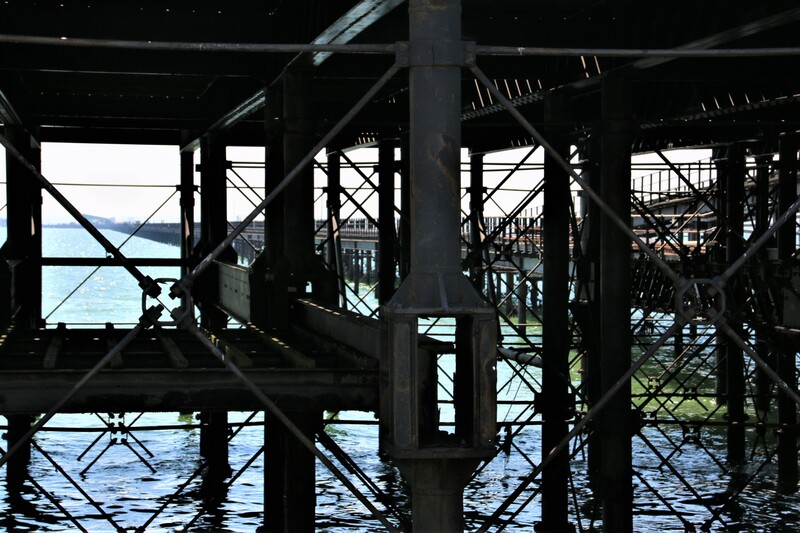 The pier itself is rather colossal. The longest pier in the world, it stretches for a mile out into the estuary until it feels like the it touches the far side. 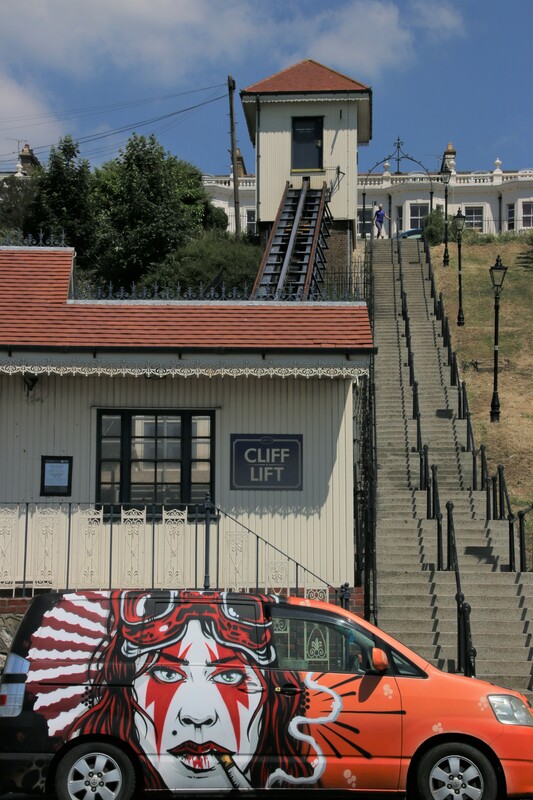 You can walk to the end or get the original train. Guess what? I took the train. 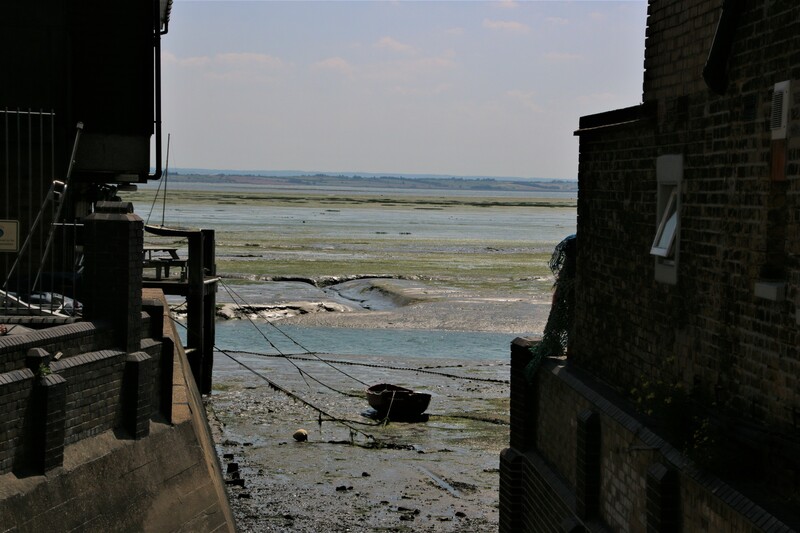 Leigh Old Town, part of Leigh-on-Sea and so included on my tour, is further up the estuary. 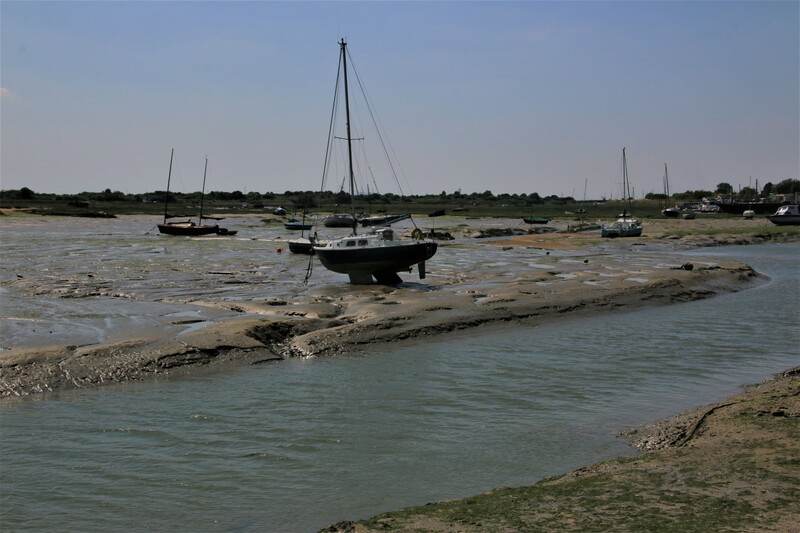 The estuary turns sand and beach into proper mud and silt, divided up by creeks and wriggling worm lines of brown sucking squelch. Is it water or is it land? Here the cockle sheds still exist but no longer a crescent of crunchy shells over which fisherman bounce over planks, unloading their catch in buckets on yokes. When the tide is right they still use yokes but straight onto the quay. The old sheds are now more glitzy pubs and bars serving young families at a ranch of trestle tables under wide umbrellas, a range of shellfish – oysters, dressed crab, lobster, scallops. 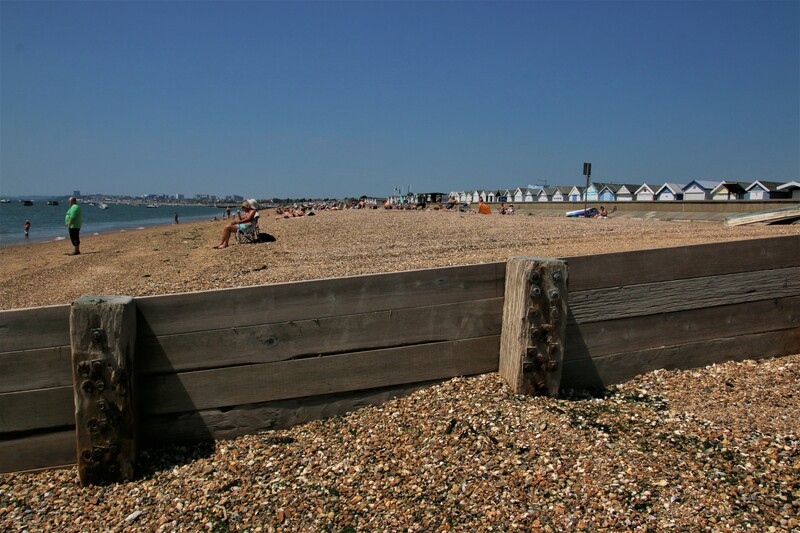 Where have the cockles and winkles and whelks gone to? Are we so superior now that these are beneath us. Great, I have now filled the gap in my journey down the east coast. I have now travelled from Berwick-upon-Tweed down and round to Bournemouth, visiting every coastal settlement on the way. Now I have to travel around the sticky out bit and up the west coast doing the same. See you soon. Yay, Rossi Ice Cream – you do know the history of it don’t you? (Status Quo!). 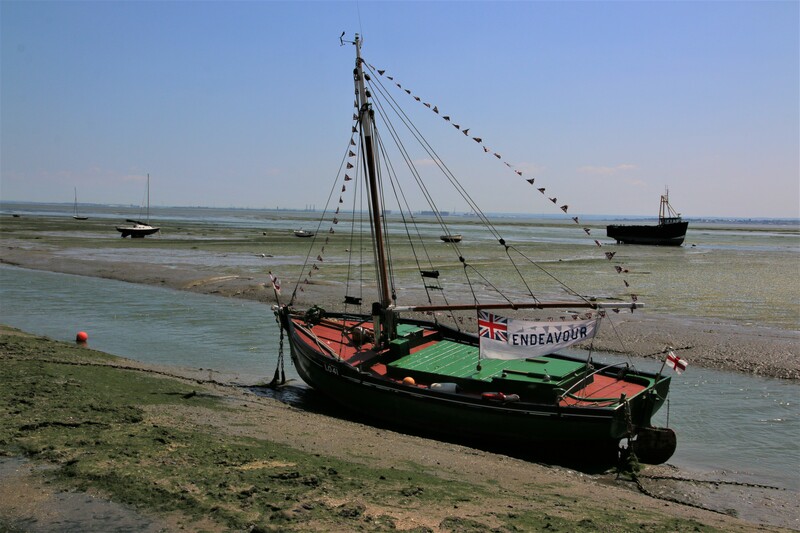 Glad you managed to visit Essex and it’s ‘coastal seaside town’ – I loved Leigh on Sea when I was a teenager but haven’t been there for ages so it sounds like it has changed a lot! My ex was bought up in Westcliffe so we went down a lot. I know Rossi ice cream but not link to Status Quo. Yea, the cocklesheds have changed out of all recognition. I remember the beach was made up of shells emptied out of the sheds . Progress eh?